Well I wouldn't generalize about a generation, for fear of getting generalized as a geriatric curmudgeon myself, but this kid is in line for some life lessons, I'm sure. Not at my hands -- I just want to get this job done. If he can't work, no problem, send someone else. Anyway, we just made it in time when the concrete truck arrived. 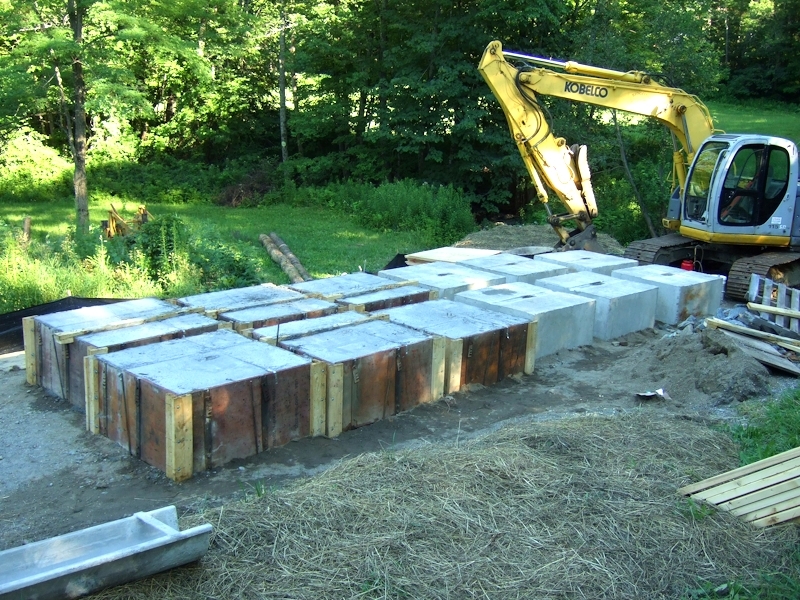 Twelve blocks poured in two days. I may work alone stripping the forms over the weekend. since it will rain Monday, and it will be a lot harder then, even with help, slipping in the mud, etc. fun. Woohoo. Not. What was the issue with the original blocks that you had Steve? Your picture reminds me of bits of our South Coast when we were preparing to thwart an invasion from across the channel in the early 1940's. Indeed Cuckmere Haven still has the anti tank blocks in place. Andrew, they were tapered (pie shaped) -- apparently intended for curved wall landscape use. Front face was 48" wide, rear face was 31" wide. Also they were 18" tall, instead of the plan 24" tall. They weighed 2600 lbs instead of the rectangular block's 4800 lbs. 1.) If laid straight, the front faces abutted, but the embankment faces were spaced apart, the mfr's intention being that 3/4 inch stone would fill the gaps. 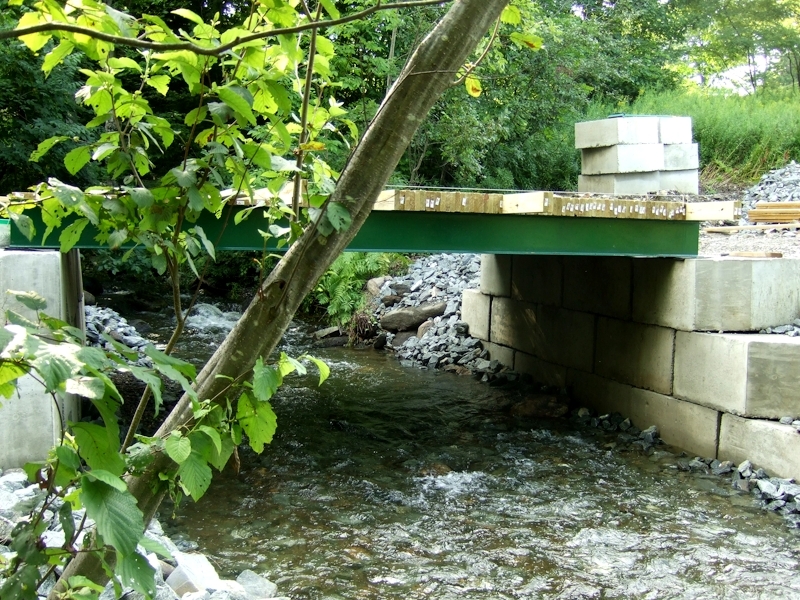 Fine for static landscape use, but a bridge abutment has moving truck loads over, and tire impact loads, not to mention trees banging into them during a flood. I thought they'd shift too easily. Also affecting tipping resistance: they were less deep, didn't abut each other, thinner (18" vs 24") and weighed about half what he design called for. The centers of gravity of the blocks (and therefore resisting moment) was also further forward toward the wider front face. To me, if you multiply three or four reduction factors by each other, you're left with a very small percentage of the resistance to tipping originally intended. I was talked into these blocks (when the excavator couldn't find 4x4x2 blocks locally) because they do have a couple of small tenons at the back that fit into mortise grooves, but no one mentioned that they were tapered wedge shaped overall with intended gravel infill. 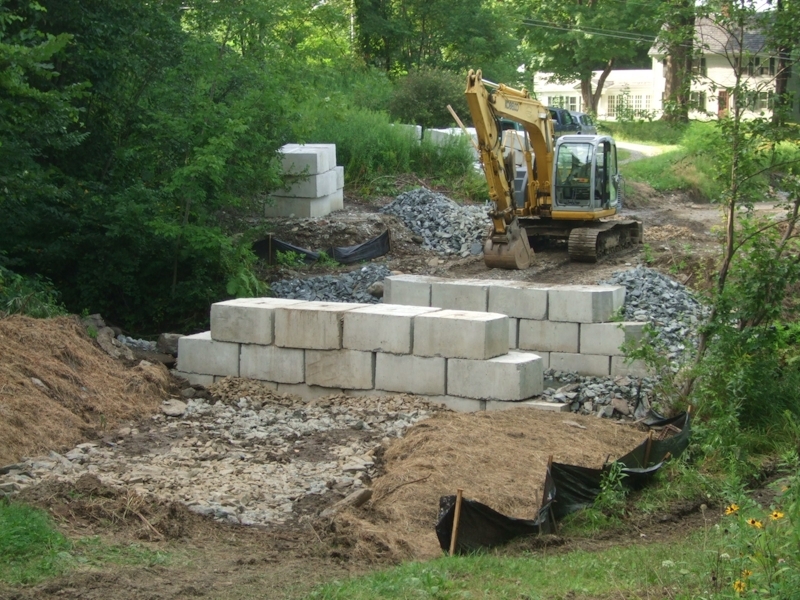 When I saw them going together, and asked where the straight blocks were (I thought the tapered ones were only for the end blocks, laid tight) I was told abut the gravel infill, and a two day "discussion" ensued. Eventually, reason won. I should add that the system might have been better if the mfr also offered straight blocks. I was confused by the fact that they didn't, but intended tapered blocks for even straight wall sections. Then I realized the advantage to the mfr. These blocks sell for premium prices (they have a decorative face, and can curve). 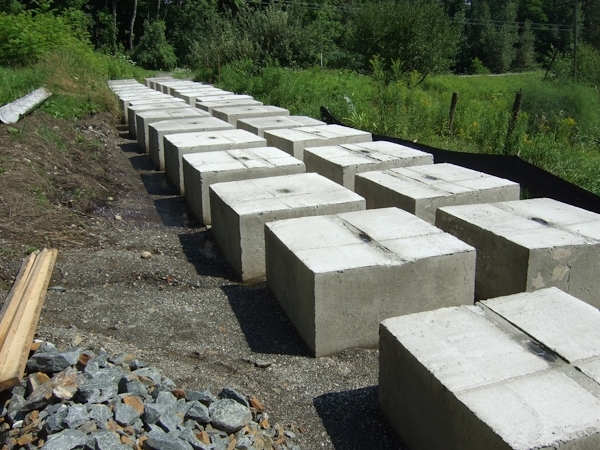 But the cost to cast them is reduced because they weigh less -- and cost is directly related to concrete usage. Thus the maker can charge twice as much and use half the material for each. Not a mystery after all. Sounds logical, as I would expect from you Steve ! How long before you can pick them up with the cast in loops? Big load and a little bit of green concrete. Talking of loads - are you casting a pad for the beams to sit on to spread the load? The cast in loops are rated at 19,600 lbs, Andrew, and they won't be moved for another week and a half, as Dave is on vacation to Nova Scotia -- first cast will have 2 weeks cure by the time he gets back, and first cast, first placed, since we are moving in a line away from the excavator. Fairly likely all will have two weeks before the last ones are moved. But they are curing very fast anyway in this heat (80-90F). They absorb a tremendous amount of heat during the day. When I unmold them in the cool of the morning after setting overnight, hot steam comes off of the sides. and you can feel the heat like a radiator just standing near. I wet them down twice a day so they don't dry out. Monday a roll of plastic is coming so I can have an easier time of it. But they are definitely moist baking which accelerates cure time.. I have to chip out the small amount of flash in the eye loops - maybe 3/8" thick, and it's tough going with a chisel even though they were cast only a day before. So I think a couple weeks is going to be fine. The bed base is 4"-6" crushed rock 2' deep, 8' wide, 30' long. This is a rocky shale area anyway, and there is ledge adjacent to the bridge location. I figure the bridge static bearing is < 1000 PSF which would be very conservative for our soil type -- not to mention the rock bedding. 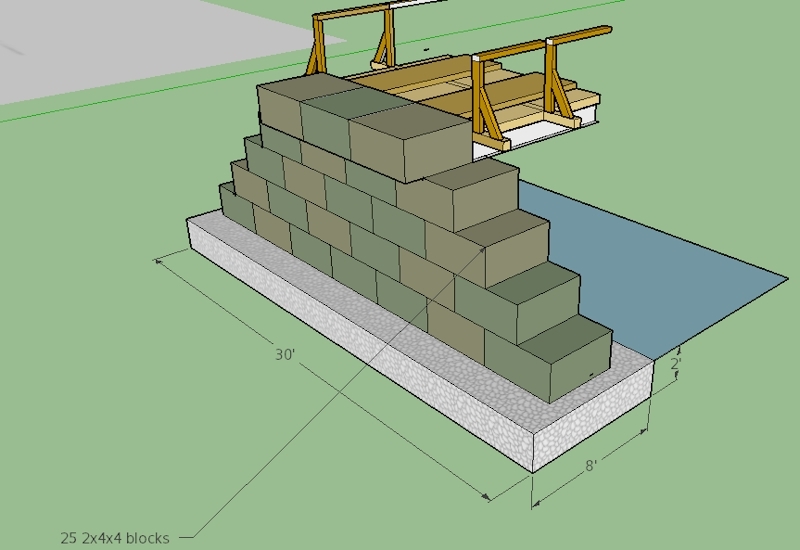 Here's a SketchUp rendering with the 4x4x2 block and stone bed. I gotta say when I read the first post I didn't think it'd be such an engineering project! That's a serious investment in concrete Steve. Were there no surplus Bailey Bridges in your neck of the woods ? Yes, guys, it's a lot! Moving and rebuilding the forms every day was extreme. Pouring all that concrete almost two weeks each day by noon was a major deal for me and the two guys who helped. It was all I could do to get a little work done on the new lathe by supper time! The reason it is this large a project is the effect of Hurricane Irene on Vermont. 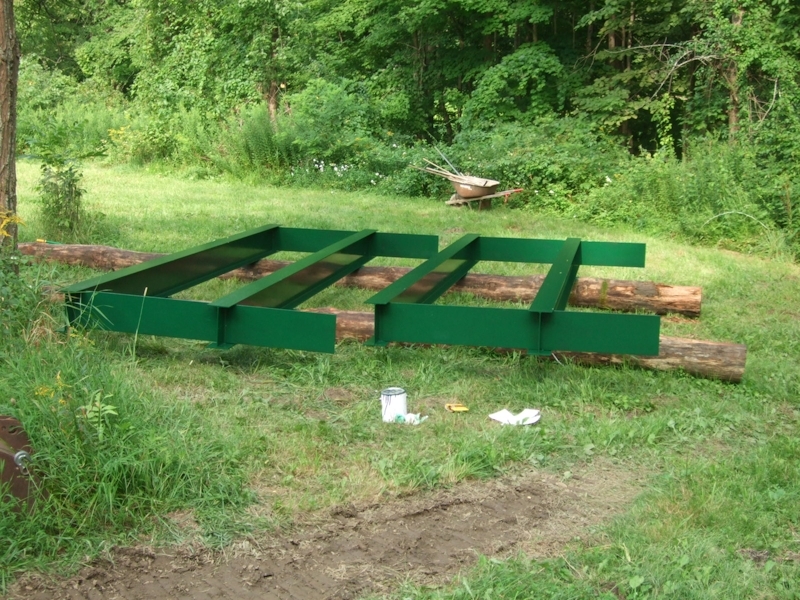 Bridge beams in place. The connecting bolt holes between the two sections were drilled in place with a borrowed portable magnetic drill press, greatly easing that job. What a great machine! Here I've started decking, as well. Lots of water for this time of year -- normally the stream would be almost dry. But it has rained most days in the past month and we had a real howler of a thunderstorm last night. The bridge decking is pressure treated 2 by 6s laid on edge and nailed together with 20d hot dipped galvanized nails on 18" centers. Nails penetrate 2-1/2 boards. All hand nailed as nail guns don't do spikes that large. I'm the hammer man, and Sam, my helper, who burned his hand Monday on a pot of macaroni, just supplied me with boards. I drove about 500 nails today with a 26 ounce hammer, and we got about half way across the span. I was ready for a break by 4:00, for sure. Will you then cover the wood with Tar or something? A very impressive quantity of straight-looking lumber to hand nail. Do you just depend on the bulk to keep it central to the steel or is it/ will it be secured in any way? I doubt there is that much straight wood in the UK, certainly not in any of the woodyards I've visited anyway. Thanks gents ! -- just on lunch break from nailing today. Quick answers to questions -- the bridge will be secured central to the beams with toe clips driven from below. I didn't want to drill through the flanges. 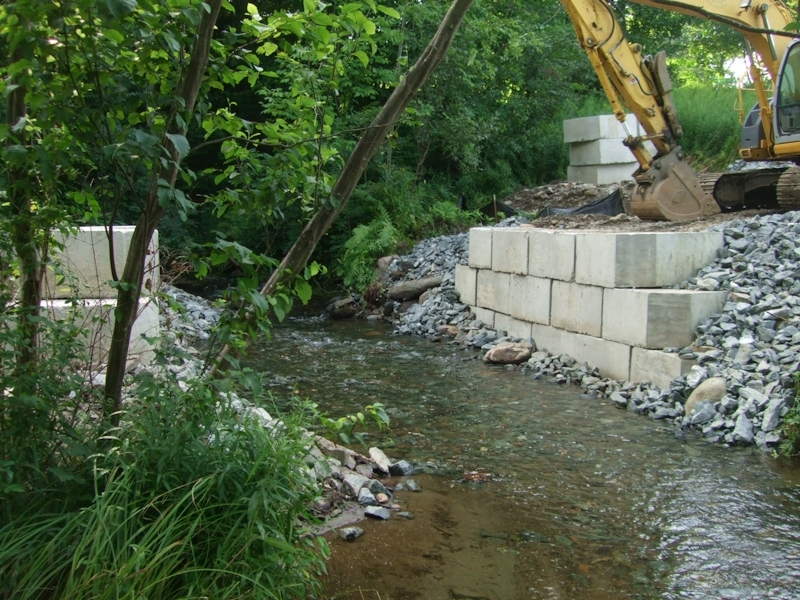 The ends will be secured for-n-aft by additional concrete blocks -- abutments -- in the true sense of the word. behind them will be gravel fill at road level. The lumber is pressure treated (preservative) made from fast farm grown southern yellow pine species. Not like the old-growth southern yellow pine, which was heavy and very rot resistant on its own, but rare now. The fast grown stuff depends on the preservative for outdoor use. It can be very wonky if allowed to dry out unsupported. It is always received sopping wet -- like green wood. So yes it's straight, as long as you don't leave it out in the sun for long! There are plenty of knots in it, and a fair amount of waney edges, which I turn downwards for the deck, as much as possible. It's not a high class of lumber, here. But it is good for outdoor stuff. 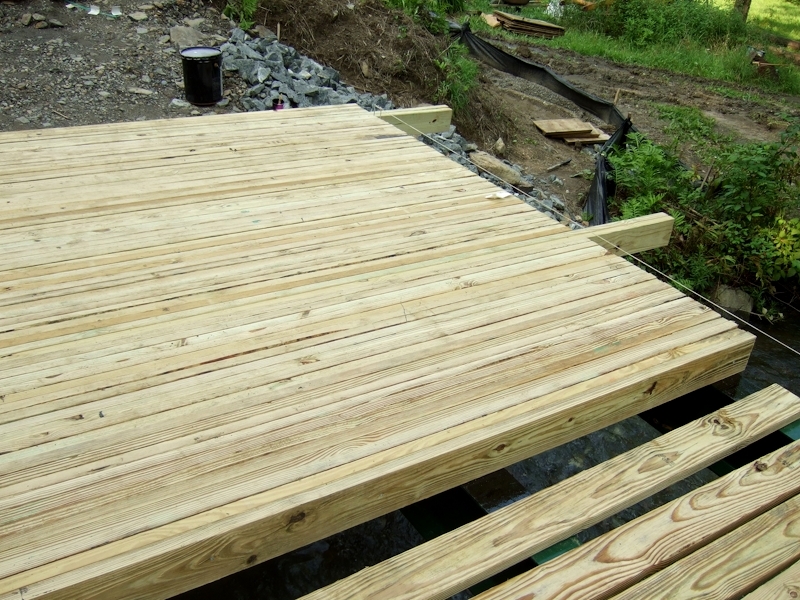 I had thought about covering with asphalt roofing compound, but I haven't sen others do that on wooden deck bridges. Not sure if that would protect the wood, or trap moisture into it. Undecided, at this point. Likely I would delay that anyway, until the pressure treated wood is more dried out. Is there a plan for them?